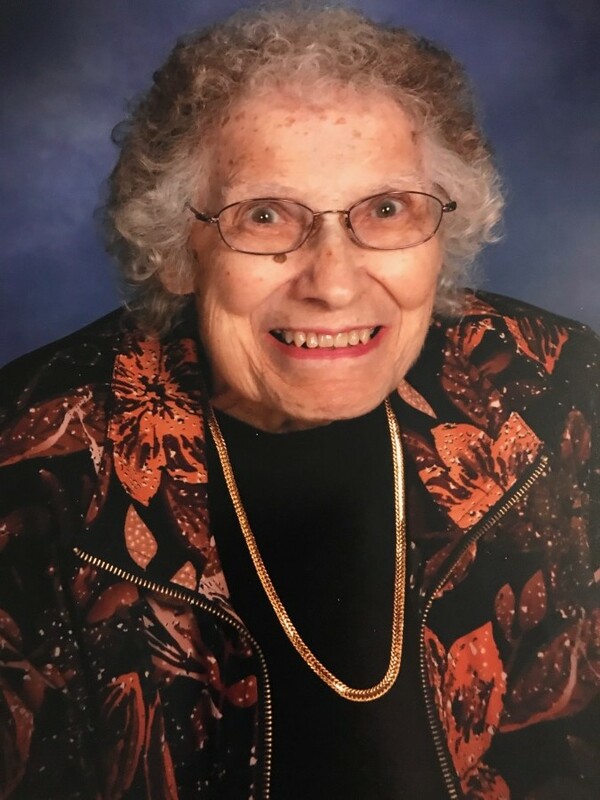 Eileen Horn, age 95 of Fremont, passed away Monday, December 3, 2018 at Stein Hospice Care Center in Sandusky. Eileen was born December 13, 1922 in Bellevue the daughter of the late Clarence and Corrine (Foos) Dudley. Eileen was a member of St. Ann Catholic Church in Fremont where she was a CCD Teacher and a member of the Altar Rosary Society. She was also a member of Golden Threads and helped senior citizens with preparing their taxes. Eileen was a bookkeeper for many years working for various businesses like Steinle Oldsmobile, Dr. Bondra and Associates, Pumps Nursery, Tangles, JLH, and Goods. She also did alterations for Pfisterer's men's store. Eileen loved playing cards, bowling, and completing jig-saw puzzles. She was a big fan of the Cleveland Indians and the Cleveland Cavaliers. Eileen is survived by her children: Paula Secrist of Fremont, Dudley “Bud” (Jennifer Hamons) Horn of Fremont, Cindy (Dennis) Hetrick of Fremont, Sande (William) Measimer of Fremont, Gary (Judy) Horn of Fremont, Mark (Cheri) Horn of Fremont and Jon (Tiffany Lewis) Horn of Fremont, grandchildren: Mike (Pam) Mezinger, Tammy (Dan) Swinehart, Scott (Kari) Mezinger, Denise Hamons, Nikki Cantu, Chad (Stephanie) Hetrick, Chris (Heather) Hetrick, Cyle (Shawna) Hetrick, Matthew Measimer, Marcus Measimer, Sarah (Tim) Reed, Laura (Justin) Rapp, Nicole (Tracy) Witt, Char Horn, Ashleigh (Jordan) Mackey, Angela (Travis) Bulger, Cassandra Horn, and JT Horn; great-grandchildren: Devon (Samantha) Mezinger, Bailey Mezinger, Mckayla Swinehart, Dylan Swinehart, Austin Mezinger, Kaine Mezinger, RJ Ritchart, Blake Myers, Destinee Cantu, Ethan Hetrick, Clay Hetrick, Dean Hetrick, Mya Hetrick, Cooper Hetrick, Xion Measimer, Mace Measimer, Gunner Reed, Jadyn Rapp, Eric Rapp, Lexi Rapp, Shauntae Feagle, Logan Witt, Keegan Witt, Gavin Witt, Braxtin Witt, Braelyn Horn, Jakaia Horn, Malayah Horn, Jaxson Mackey, Jarek Mackey, Adley Mackey, and Anaya Bulger; two great-great grandchildren; and several nieces, nephews, and Godchildren. In addition to her parents, Eileen is preceded in death by her husband, Edward “Bud” Horn, whom she married March 2, 1946 and passed away December 7, 1974; sisters: Mary Louise Dudley and Irma Haaser; brothers: Leonard “Mose” Dudley and Gene Dudley; and grandsons: Eric Horn and Larry Hamons. Friends will be received Monday, December 10, 2018 at St. Ann Catholic Church, 1021 W State St, Fremont, OH 43420, from 9:00am until a Funeral Mass beginning at 10:00am. In lieu of flowers, memorial donations may be made to St. Ann Catholic Church or Stein Hospice.